Traceability, more interventions, and cannabis headline the new year as we continue our coverage of the food safety and regulatory issues on tap for 2019. David Acheson, former associate commissioner for foods in the FDA, recently discussed talked about two of his five food safety and regulatory expectations for 2019. You can read about those first two expectations here. Below are the remaining three for 2019. We can expect to see the use of blockchain technology to be increasingly advocated to improve food traceability. This comes in light of the recent romaine outbreaks (among others) and the appointment of former Walmart Food Safety Vice President Frank Yiannas to FDA deputy commissioner of food policy and response. Yiannas was the driver of a blockchain produce traceability initiative for Walmart suppliers and is likely to bring this passion with him. Time will tell if blockchain is going to be a solution; it may be part of the solution, but as we have said before it will require good data entry to work. Along with this is certain to be increased digitization – use of IoT, digital sensors, and digital checklists throughout the food supply chain for transactional documentation and record keeping. Worldwide, food companies and retailers – and everyone in between – are moving away from conventional pen and paper systems and increasing their efficiency through digital records and monitoring. We also can expect to see a focus on supply chain controls, especially in regard to the Foreign Supplier Verification Program and imported ingredients as brokers and importers become more familiar with the regulations and as FDA ramps up inspections. With each of the too-many produce recalls and outbreaks of 2018 – including the largest E. coli outbreak in more than a decade – the public has lost confidence in produce, making it a challenge for the produce industry to change perceptions. 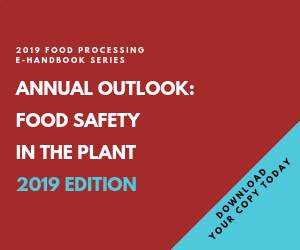 An expected trend for 2019 is the focus and development of produce safety programs to strengthen businesses through training that ensures latest best practices are understood and applied. There also will be continued focus on development and optimization of effective food safety interventions and technologies in the fields, during processing, transport, handling, and storage of produce. Food safety testing is expected to see continued growth as regulations evolve. Import and export testing, residue limits and labeling restrictions all force food laboratories to come up with new and improved testing methods to keep up with ever-changing laws. Other opportunities for growth are stemming from the continued implementation of the Food Safety Modernization Act, along with new food safety plans coming into effect in China. There was a spike last year in regionally based Hepatitis A outbreaks. The infection is so easily spread from foodservice workers, and so preventable at the same time, so it would be reasonable to see more foodservice industries offering free Hepatitis A immunizations to their employees in order to protect their brand name. It’s been an ongoing issue and we’re unlikely to see any sudden end in 2019: that is, the continuation of undeclared allergens as a major cause of food recalls, both from uncontrolled supply chains for ingredients, and items mispackaged in house. We would prefer to be wrong on this one, but, unfortunately, we do expect to see an increase in food fraud cases, including those considered to be economically motivated adulterations as defined by FSMA, that are food safety issues. With its issuance of draft regulation on Dec. 21, 2018, the Government of Canada will be following up on the legalization of recreational cannabis with regulations for edibles. Predictions are that this will be a very contentious issue for politicians and the public, as concerns about children having access to THC-infused candies, chocolate, and beverages are heightened. Labeling and child-proof packaging requirements will be rigorous. For this reason, licensed cannabis companies are gearing up to have product ready for the October 2019 implementation. We also see 2019 as the year of change around the world in cannabis legalization and use. Many countries in Europe and Asia as well as Australia are now opening up for medical use of cannabis. Likewise, more and more U.S. states are legalizing medical and recreational use. This global business will explode in 2019. Companies who are getting into these markets early are positioned to expand rapidly. Edibles will be a huge part of this trend and the safety of these products will be under scrutiny, especially if there are food safety or dosage issues with these products. As such, we sincerely expect and hope for there to be continued growth in the literacy and understanding of food safety in the marijuana edibles markets. We see this as especially applicable to CBD and other cannabinoids (CBG and CBC, etc.) now that the 2018 Farm Bill has delisted industrial hemp and its cannabinoid derivatives from the Controlled Substances Act. From that, we foresee FDA clarifying the legality of hemp-derived CBD foods to address the already massive and expanding market of candies, gummies, chocolates, soda, coffee, beer, etc. There also is the possibility that, for the first time, a state legislature may pass an adult-use cannabis law without a voter initiative/proposition.